Gov. Greg Abbott has appointed former state representative Tryon Lewis and San Antonio banker J. Bruce Bugg, Jr., to the Texas Transportation Commission. Both appointments are subject to Senate confirmation. Once they are confirmed, both men will become part of the five-member commission which oversees the Texas Department of Transportation. Gov. Abbott also used his State of the State address to re-iterate his budget plans. Abbott’s budget will focus on providing tax relief to Texas employers and job creators, calling for reductions on property taxes and the business franchise tax. Abbott also emphasized paying down the state’s debt, and called for a constitutional amendment that would limit the growth of the state budget to population growth plus inflation. Senate District 26: State Rep. José Menéndez will succeed Leticia Van de Putte, beating out State Rep. Trey Martinez Fischer. Menendez will serve the remainder of Van de Putte’s term. A special election to fill the seat for House District 124 will occur at a date to be announced. House District 13: Leighton Schubert, an attorney from Caldwell, defeated former Austin County Judge Carolyn Bilski for Sen. Lois Kolkhorst’s empty House seat. House District 17: John Cyrier, a business owner from Lockhart, will succeed Tim Kleinschmidt after defeating fellow Republican Brent Golemon. House District 123: Diego Bernal, a former San Antonio City Councilman, will succeed Mike Villarreal after defeating State Republican Executive Committeeman, Nunzio Previtera. If the streets of Austin could talk, what would they say? 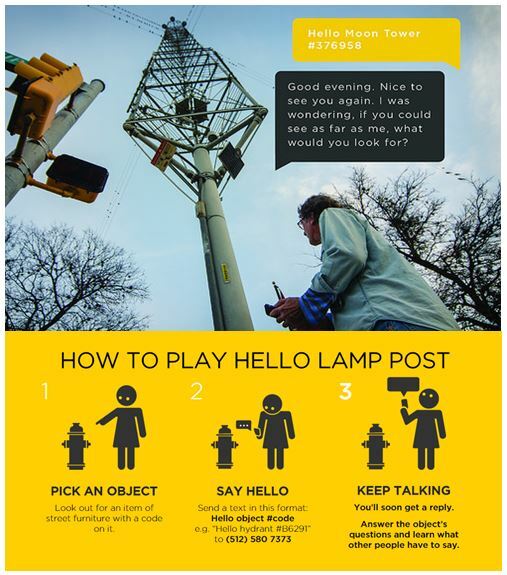 Thanks to the ‘Hello Lamp Post’ project you’ll be able to find out! ‘Hello Lamp Post’ is a city-wide platform for play that lets you “talk” to the city’s infrastructure. In addition to lamp posts, participants can text mail boxes, bus stops, manholes, and moontowers; answering questions, sharing stories, and joining in a conversation with fellow Austinites. The project is a part of a temporary art installation running from February 12 to April 27, commissioned by the City of Austin Cultural Arts Division of the Economic Development Department and in partnership with Art Alliance Austin.